In the last two years, Gerry Brooks has gone from principal of an elementary school in Kentucky to Internet star. He has garnered millions of followers on social media. 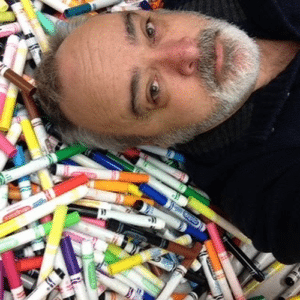 His hilarious videos connect with and inspire educators. He’s one of the world’s most popular school principals. One might think someone who gets millions of views on every video he creates and can sell out 1000-seat auditoriums every weekend across the US would devote all of his focus to this new endeavor. But every Monday through Friday, you can find Brooks roaming the halls of his school in Kentucky. He remains fully committed to his role as principal and has no plans to leave the front office, unless it’s to hang out with kindergarteners or grab a suriously delicious puddin’. We got the chance to chat with Gerry. He talked about a variety of things—the state of public education, what it’s like having such a large social-media following, and where he’ll be on the first day of school. As always, his answers will inspire you—and make you laugh. School Leaders Now: Why do you like making teachers laugh so much? Gerry Brooks: I think humor is often what gets us through the day when we’re in a very stressful situation. It’s just satisfying to know that making fun of something that we all are going through really brings us together as a unified group. Yeah, well, I think any educator. I mean, I have bus drivers and school nurses who follow me, people that are dealing with the different sides of education, from parents to teachers to students. And so, really it has to do with anybody in education. A cafeteria manager gets an angry parent as much as the teacher does. So really the unified group is the cross profession of people who are dealing in education, no matter what their position is. What do you think this group takes away most from your work? So it doesn’t make a difference where you’re at, or what school you’re at, or what nation it is. I mean, I’m surprised people from all across the nation, and even people in China and Philippines, follow me. People see they’re dealing with the exact same things, because, you know, education is what it is. How would you describe the state of education right now? Would you call it positive? I would say it’s a positive situation because I think we have so many dedicated educators and administrators and people working with kids. So that’s very positive. However, I think that we are also in a very stressful profession because we’re not being supported the way we need to be supported. No matter how great your job is, if you feel underappreciated, it’s stressful. And so, people are in it because they love kids and they love what they do. Nobody ever went into education for the money. But at this point, it’s not only not about the money, but it’s also about the disrespect, lack of funding, arguments about healthcare or retirement, and all sorts of other things. So the state of it for the teachers and the kids is still a very positive thing because people are showing up to work and doing their best job with the kids, despite the hand that they’ve been dealt. But it’s a very stressed state when it comes to politics and decision makers, because I think teachers are not getting the respect they deserve from those outside of the education world. You’re a strong proponent for improving education through action. You even march at rallies alongside teachers. We don’t see a lot of principals doing that. Why do you think that is? Well, I think it just depends on where you’re at. I mean, I think where we are, in Kentucky, there were a lot of principals, there were a lot of administrators marching. 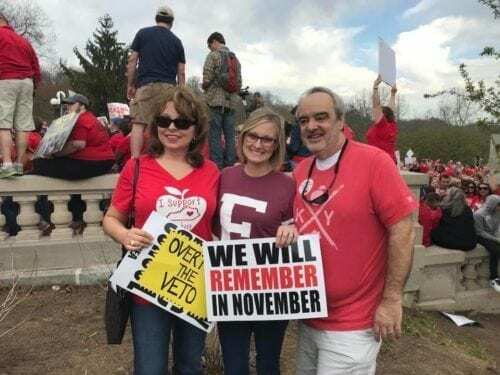 In Kentucky it was very interesting because it was not just public school teachers, it was all public workers fighting. But I also think that people are very nervous to take a stand. People ask me all the time, “How do you say what you say without getting in trouble?” And I would say, “Free speech.” But I think the higher your position and the closer you are to the answering of accountability of central office, the less willing you are to go out to a rally and hold a sign, knowing that your meeting next week is with the superintendent. Whereas the teacher is out there, and their meeting is with the principal, who agrees with them. But you show up and are in the news anyway. So why is standing up for your teachers worth it to you? Well, this is personal. It’s very personal. I feel like I’m at the point where I could retire if I wanted to. But if I was a fourth-year teacher, nontenured, then I might be a little bit more worried. I’m at the place in my life where I feel like I have to take a stance. I need to. And I think the best part of all of it is we are a collective bargaining team. And so when we look on TV and see folks in North Carolina, Arizona, Oklahoma, or West Virginia protesting, we don’t see 15 people, we see thousands upon thousands of people out there. It’s empowering to know we’re in this together. 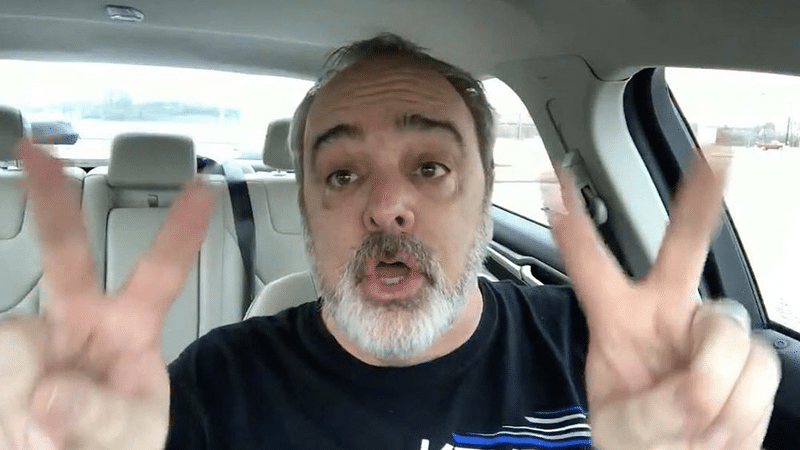 You make it very clear in your videos that you love and appreciate teachers. But this profession is getting harder and harder, and a lot of districts are having trouble finding people to teach. What do you say to a young person who’s about to go to school right now to become a teacher? Well, it’s still a great profession. It truly is. But I just think that you need to have a reality check of what you’re getting into. Financially it can be a struggle. If you’re a breadwinner or you’re supporting kids on your own, the income is not where we would like it to be. However, it is a tremendously rewarding profession. So I tell people it’s a great job, go into it. You just need to know what you’re getting into. Teachers are not going to be in Hawaii every year on a vacation, but they are going to have a roof over their head, they’re going to enjoy life, and they’re going to love their job. Get into it, make smart decisions, know what you’re getting into. I don’t want to discourage anybody. It’s not like it’s so detrimental that it’s horrible; it’s just not where we want it to be and where we need it to be for the work we put in and the respect that we deserve. What trait do you think every school leader should have? I think they need to have thick skin. I think if you don’t have thick skin as a leader, then you take things personally, and you end up jumping back on people when they jump on you. You end up being irritated with things you shouldn’t be irritated with. That was a hard sell for me my first year, but now I’ve just gotten to the point where when someone’s angry about something, I see it as passion, and not anger. What do you think every teacher should possess? So I think it really has to do with a passion and a love for teaching. Because no other career is as rewarding, and so it equals out in the end. What are you going to do on your first day with staff this fall? I’m going to protect their time. Just because they need six hours of PD doesn’t mean I need to talk for six hours. I think that those couple of days before school starts are a tremendous stress on the teachers. So I have to watch our time and not spend all of it in PD and meetings, because they have to get to their classrooms. They’ve got to get things done. We don’t want to add to their stress by just overloading them with meetings. What are you going to do at 8:00 AM on the first day of school? I’ll be in every classroom. I love standing at the door, watching the kids come in and watching the parents interacting with them, watching how stressed the parents get! I’ll encourage the moms and dads by telling them that it’s going to be all right and that they’re going to see their child in six hours. And then I spend the entire day in the classrooms. In the past couple years, you’ve seen a lot of new opportunities, including the chance to tour the country regularly. You probably don’t need to keep your day job as a principal anymore, but you keep doing it. Why are you staying in school? Well honestly, I’m in the perfect situation. I have an unbelievable staff. I have tremendous parent support, even though there are parent struggles. But I feel like the school that I’m at right now, I’m there for the exact reason that I need to be. I could not leave town on a Friday at 4:00 PM to go speak if I didn’t know that I wasn’t coming back to a great school on Monday. The kids are where we need to be. We’ve worked so hard to get our school to where it is, and I cannot imagine leaving. It really and truly is what I believe to be a perfect position for a principal. So you’re having too much fun? That’s right! I mean, it would be more relaxing to not do both. I would be able to spend some more time at the places that I visit and all that. But I’m perfectly happy where I’m at. I just feel like I’ve gotten the best of both worlds right now.